20" necklace with 6 mm oval and 9 mm round white pearls with aqua Swarovski crystals, sterling silver spacers and toggle clasp. 16.5" necklace featuring peach colored 6 mm oval freshwater pearls with gold-filled safety clasp. Necklace and earring set: 18" necklace with 8 mm individually knotted semi-round white freshwater pearls, gold-filled ball clasp. 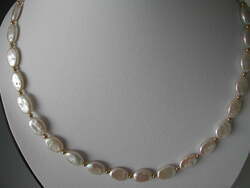 18" necklace with 6.5 mm individually knotted round white freshwater pearls, 14K white gold clasp. Due to increases in the price of gold this cannot be duplicated at this price. 15.5" necklace with 12 mm freshwater white coin pearls with 3mm 14K gold balls, purple Swarovski crystals, 14K gold clasp. 18" necklace with 6-8 mm semi-round white pearls with 3mm 14K balls, 5 mm gold-filled corrugated balls, 14K gold clasp, individually knotted. 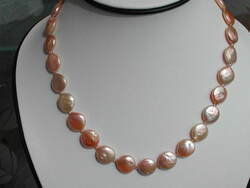 19" necklace featuring 6mm white freshwater pearls, multiple colored Swarovski® bi-cone crystals, ​14K gold conical spacers and beads and 14K toggle clasp. 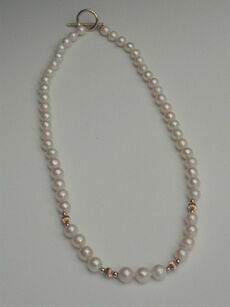 20" necklace featuring white 9mm x 12 mm oval coin pearls separated 14K gold balls, 14K gold loop and toggle clasp. 17.5" necklace featuring double strand semi-round 6.5 mm white pearls, individually knotted with a 14K gold safety clasp.